If you are a fan of Maisha’s Lemonade Stand on Facebook then you know I am a big advocate of FREE tools to help you grow your business. Mind you, I am not a finance lady but even I understand keeping the costs of running a business as low as possible when starting out. I thought I would help budding entrepreneurs with marketing tools that you need at this stage of your business which I call the “IDEA but a REALLY GOOD IDEA STAGE”. My last post talked about the elevator pitch. So with your IDEA but a REALLY GOOD IDEA , your elevator pitch and with the tools below you are ready to go get your first customer! Facebook page – I am a big advocate of social media and not just because of its ability to engage with customers on a personal level but because its FREE! There’s a time commitment but as soon you get to 30 likes it can function as your website. A landing page allows you to collect names but Facebook powers you to learn about your customers! #ALWAYS PUT CUSTOMERS FIRST! Email – I don’t think I need to get into email except to say that if you know what your website is going to be then reserve the domain name and use the email address that goes along with it. If you don’t know what your idea is going to be called then an email with your name is fine. However, Erika Dickstein, Owner of Spring Insight really disagrees with me. You should have seen the emails that flew back and forth about using Gmail or a branded email. Logo – Now, if you insist on a logo for your brand I found a great DIY resource. Logo Garden is a free logo design and website company. I played around with it and had fun but I couldn’t find the image that I wanted. But, if I knew about it six months ago I would have used this site instead of Vistaprint! Well, I have more ideas so I will get it another shot. Email marketing – Now, this is a borderline item and depends on who you’re communicating with, how many and how often. I used Mail Chimp to let my audience ( friends and family) know what I was up to, a few successes I had earlier. It was perfect, professional and FREE. I have since upgraded to Constant Contact. CRM – I’m a technology marketer first so whatever tools there are to make my life easier the better for me. Capsule CRM is one of these. It’s a great resource for you to capture customers information, forecast and see your win and loss ratio. If you add these tools to your first sales and marketing kit you are on your way to start up success, your first customer! While it’s true that in some cases a logo is unnecessary, I think as the world gets reduced to more and more information bites, having a visual image is more and more critical. That doesn’t mean your visual image has to be a logo—the visual image I frequently use is one derived from my logo. As a result, it functions like a shorthand reference or visual cue. Since I know that my logo makes a good first impression, this simple image is often all I need to prompt recall. As a business strategy consultant I would advise any business to think about how they can translate their brand value or core identity visually as a logo, even if they just want to put their name into a “logo type” rather than use an image. More importantly, however, I would highly recommend they create at least one related simple image, embodying an obvious connection to their brand that they can use as a visual cue on a variety on communications, especially on mobile sites, apps, etc. I also want to recommend 123Print.com instead of Vista Print as an online business card supplier. Their interface is very simple and, best of all you can get cards, along with other printed supplies, without their logo printed on them. I’ve sent many a former Vista Print user their way, and they’ve all been much happier with their options and results. Check them out now or when you’re ready to reorder, and let me know what you think. And, for anyone that hasn’t been on MailChimp in a while, it’s worth checking back in with them; they’ve recently made some significant improvements in the integration with social media sites and platforms, email programs, and WordPress. They’ve also added quite a number of new free features and functionality—it’s pretty impressive what you can do without any cost at all. And, if you want to pay for their premium tools, you may actually get more for your money than Constant Contact, but I think which one you go with really depends upon what you’re looking for in an e-marketing campaign management system. Please Note: I don’t represent 123Print.com or MailChimp in any way or receive any kind of money from endorsing them or sending customers their way; they’re just tools that I both use and recommend to my clients when appropriate. Just so that’s clear. 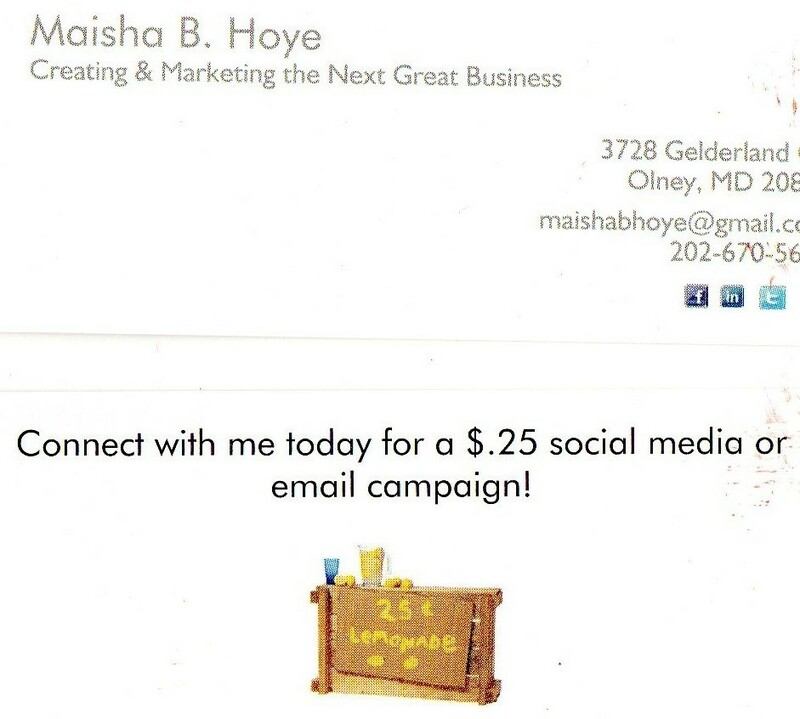 Thanks, Maisha, for the heads up on Capsule CRM and for following my blog: Get Growing! Thanks for the comment! The tools I mentioned were the tools I used when starting and this so I could get started make the leap from idea to actuality. There are many, many, and many more FREE tools available. It is America the land of choices but as you said, we all have to do what’s best for our business at any particular moment in time! The most important thing is to get started and then Get Growing! Love your target market BTW! It fits me perfectly!